The Shakespeare Way follows a route that the great poet and playwright may have taken when he left his birthplace, Stratford-on-Avon, for London sometime between 1585 and 1588. We cannot know the exact route that he took but we know that he had connections in Oxford with his friend and inn-keeper, John Davenant, whilst he was of course familiar with the countryside of Warwickshire and probably of the Cotswolds, which feature in Richard II. The Shakespeare Way passes through some beautiful places and beside notable landmarks, including the Rollright Stones, Chipping Norton, Woodstock (close to Blenheim Palace and the burial place of Sir Winston Churchill at Bladon), and Oxford. 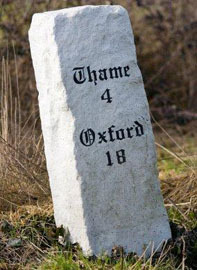 We offer a route that includes the best parts of the route between Stratford and Oxford. This route has been developed in order to raise funds for the Shakespeare Hospice in Stratford. British and Irish Walks will donate £5 to the cause for each booking made. Arrival Stratford-upon-Avon for overnight. Set in the beautiful rural Warwickshire countryside on the banks of the river Avon, it is a handsome town in its own right and home to one of the world's great theatrical ensembles, the Royal Shakespeare Company. Cross the River Avon and the River Stour to leave Stratford then follow the river banks for the first part of the trail, across farmland and thatched cottages, watermills and village churches. The path then brings you to the market town of Shipston-on-Stour, known in Shakespeare’s time as Sheepstown and today a lively market town. Walk to Chipping Norton. Today, you pass close to the Rollright Stones, an ancient site located on the Oxfordshire/Warwickshire border. The complex consists of three main elements, the King's Men stone circle, the King Stone, and the Whispering Knights. Arrive at Chipping Norton, once a centre of the wool industry and trade - it retains many elegant buildings from that era and has evolved into a thriving and vibrant local economic and cultural centre. Overnight Chipping Norton. Walk to Woodstock. Follow the Glyme valley through Ditchley Park and past Blenheim Palace to the picturesque town of Woodstock, which originated as a settlement within the Royal Forest of Wychwood. Blenheim Palace was built between 1705 and 1724, as a gift to John Churchill, the 1st Duke of Marlborough in appreciation of his defeat of the French and Bavarians at the Battle of Blenheim. A UNESCO world heritage site, the architect was Sir John Vanbrugh and the landscaped gardens were designed by Capability Brown. Overnight Woodstock. Walk to Oxford. Pass through Bladon, where Sir Winston Churchill is buried in St. Mary's churchyard, then cut across country to the Oxford Canal before following the River Thames into the city of Oxford, one of the great university towns of Europe. Overnight Oxford. Variable but essentially easy to moderate - nothing strenuous if you are able to walk the distances concerned. Bed and Breakfasts. Along this route, there is a wide choice of good bed and breakfast accommodation in both Stratford upon Avon and Oxford. In the villages, we may have to upgrade to hotels. We will discuss the options and price differences with you. Comfortable, well aerated clothes in keeping with the season. Always bring a pullover, good walking boots (already worn-in) and several pairs of cotton or wool socks. For your daily needs, you are advised to have a plastic bag to line your day-pack (to protect the contents from rain), rainwear, a sun-hat, sun glasses, sun block, a water bottle, plastic picnic boxes (for transporting your lunches), first-aid kit , camera and film, torch/flashlight. Stratford-upon-Avon is easily reached by train. The nearest airport is Birmingham. 5 nights accommodation with private bathrooms (either hotel or Bed and Breakfast depending on option chosen), 5 breakfasts, route notes/maps, luggage transfers. Transportation (except for luggage on walking days and transfers where part of the walking programme).